We want the internationally accepted term “gender equality” to be at the basis of all government policies. We want the establishment of properly funded Status of Women offices in all provinces and territories, as well as properly funded local women's programs and services. That "Inequality rises across the G20 as economic growth leaves the poor behind" reports Oxfam Canada. Strong economic growth since 1990 has failed to lift people out of poverty in almost every G20 country, according to a study by international agency Oxfam. That there has been a noticeable retreat from gender equality work, as the sector focused on women’s rights and gender equality has been severely reduced. Fearing the loss of funding, NGOs are reluctant even to use the term “gender equality” in their proposals. CIDA (Canadian International Development Association), Match International and CCIC (Canadian Council for International Cooperation) have felt that by removing the words "gender equality" from their proposals they will have a greater likelihood of success. That in the past, Canada stood out amongst decision makers in its efforts to support gender equality and to ensure that women were benefiting from globalization. Canada’s retreat is happening at a time when other governments worldwide are increasing their investment in the rights of women and girls. The establishment by the United Nations of the UN Women agency is a recognition of the fact that the ending of poverty is only possible when gender discrimination is ended. That in the Gender Gap Index, (Published by the World Economic Forum) Canada has dropped from 7th place in 2004 to 25th place in 2009, below Ecuador, Mongolia, Lesotho and South Africa. That in April 2007, twelve out of the sixteen Status of Women Canada offices were closed on the grounds that women's and men's issues do not need to be separated and that women’s equality has already been achieved. Status of Women Canada works as an advocate for women’s equality, sharing knowledge and information with other federal and provincial departments in order to advance women's economic equality and human rights, and eliminate violence against women. That in 1986 the Employment Equity Act was passed. Its purpose was to: "achieve equality in the workplace so that no person shall be denied employment opportunities or benefits for reasons unrelated to ability and, in the fulfillment of the goals, to correct the conditions of disadvantage in employment experienced by women, Aboriginal peoples, persons with disabilities, and visible minority people by giving effect to the principle that employment equity means more than treating persons in the same way but also requires special measures and the accommodation of differences." That in Sept 2010, people from every province and territory, representing Canada in all its diversity of race, ethnicity, class, disability, language, sexual orientation and age, were invited by the Right Honorable Michaelle Jean to participate in The Governor General’s Conference on Women and Security. At the conclusion of the conference, participants issued a Declaration calling on all levels of government to renew their commitments to the full realization of women’s human rights, in accordance with international treaties that Canada has ratified. They were further urged to make immediate and adequate allocations of resources to achieve that end. 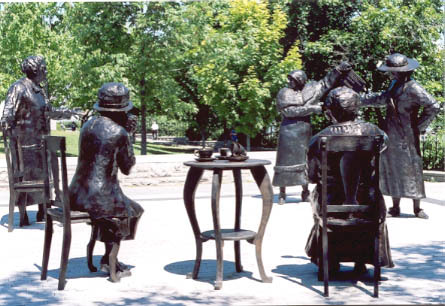 Photograph: Nellie McClung at the Women Are Persons monument in Ottawa.